Looking back, the torrential rain downpour that arrived last night was definitely an ominous warning that something was going to happen… and so it was in the match where, aside from some brief chinks of sunshine from Pavel and Chris – who both drew – the good ship Totally Hammered lived up to its name, losing 4-1 to Streatwise. We were out graded on every board, so considering the situation, our draws were a fantastic result. For those wishing to relive the experience, all the games are now up on the Summer League website. We also welcomed two new players to the club for their debut games: Nadim Osseiran and Chris Dmitrov! I believe they are both coming along to next Monday’s club night, so please give them a warm welcome when you meet them. Hot, hot, Summer League action!! Anyway team, let’s not dwell on failure – we have a few weeks to prepare for the next match in July (18th July – save the date!). Six boards to cover, many beers to be drunk, and a chance for vengeance!! Anyone wishing to play, please get in touch! Ken K, Totally Hammered Captain. Full set of games below – Captain’s report from Just Hammered vs Battersea Volts still to come… It contains the only ray of sunshine from the evening – a victory for one of our newest – and certainly our youngest – member, Nadhmi. Pleased to say we’ll also be posting a full analysis of that game from one of our strongest players. Stay tuned!! 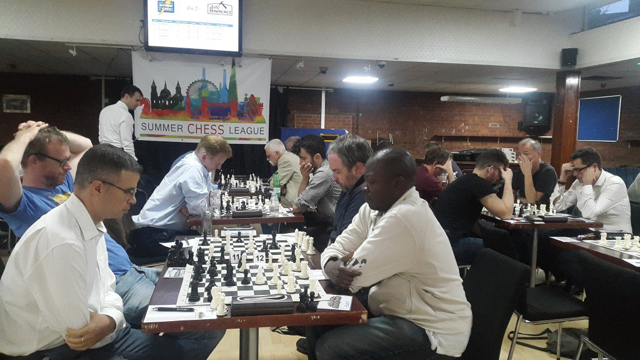 The British Bangla Chess Association are having a 10-minute blitz tourney this coming Sunday – the 2nd July starting at 3pm. Well done, Nadhmi..! Only Hammersmith winner on the night.